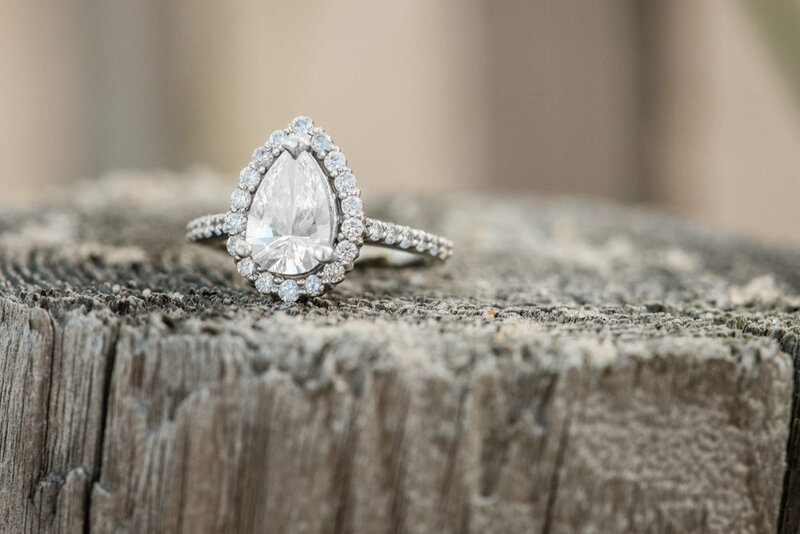 Oh, Long Beach Island engagement sessions (and weddings) are my favorite! 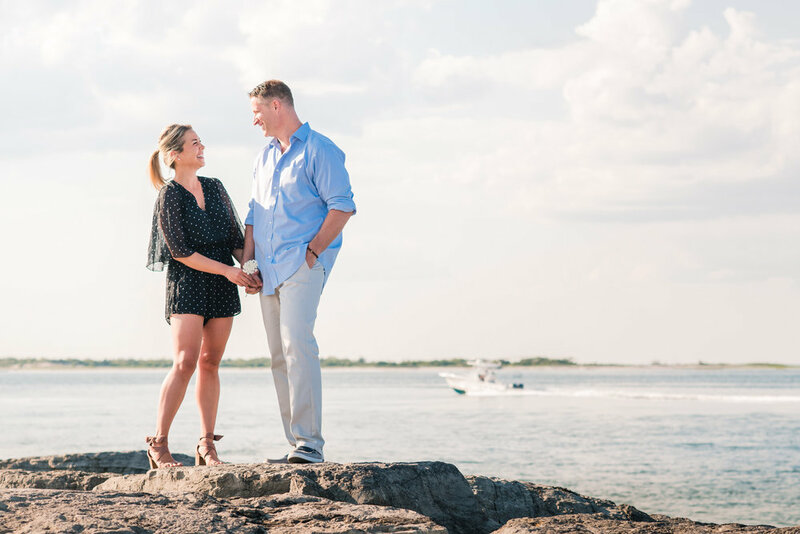 This engagement session started in Barnegat Light, Long Beach Island and ended at Fantasy Island in Beach Haven, NJ. Long Beach Island is Jackie's second home. Her family has spent every summer here in the same house her entire life (and her parents have been making the trip to LBI each summer before she was born). Neil also has a connection with Long Beach Island and it's been his summertime highlight for many years as well. Jackie met Neil back in the Spring of 2015 through a mutual friend. "There was a group of us out to dinner, where Neil thought it was funny that I ordered Italian flatbread pizza at an Irish Pub. We all ended up at a bar that night and when the night was over Neil and I connected over Facebook where I made him aware he had gotten a parking ticket that night." From then on, they graduated from FB to texting and the occasional phone call. "Neil was old school where as I was millennial and felt phone calls were reserved for parents. Ha!" One time in passing Jackie had mentioned that she had never received flowers from someone for no reason. On the next date she had with Neil, he showed up with a beautiful bouquet and simply said, "You said you never got flowers for no reason now you do". Right here is where most people would think that's where their story ends, where their love story began and that they lived happily ever after. Not the case. Jackie and Neil remained friends for over two years. "What changed you ask? Well, a stranger at a wedding summed it up quite well for me, she said she got our story and told me Neil is the forever guy and that I had to get to that place where I was ready for it. I remember sitting really thinking about her words because I had never thought of it like that but it was true. Neil is my soulmate and he didn't have to prove that to me but he did time and time again by being my best friend. And I couldn't imagine my life without him." Now on to the fairy tale part, THE PROPOSAL! It was December 23rd, 2017, and the plan for the day was to go to a local outdoor ice skating rink that Jackie's family traditionally goes to every year. Neil went as far as to even buy them both brand new skates! "Some would say that should have been a red flag but if anyone who knows Neil it's standard procedure to go above and beyond for everything." So off they went to Bear Mountain State Park in NY. Jackie was skeptical they'd even get on the ice because it was unseasonably warm and rainy that day, but regardless they were going to get drinks and dinner at the lodge. Letdown number one for Jackie was finding out the ice rink was closed that day due to the weather. So they were told the indoor carousel on the grounds was open and figured they'd take a stroll over that way for fun. The sign said the carousel was open until 5pm and it was barely 4pm but it had for some reason forever unknown to them been shut down early. (Letdown #2). Pretty atypical for Jackie, she shrugged it off and thought nothing of it. Easy going Neil however was more out of sorts but it still didn't register as unusual for her. When they got to the lodge, they were seated next to the over-sized rustic fireplace lined with Christmas stockings. They ordered drinks because they didn't have reservations for dinner until later on. Neil started to get impatient that the waiter hadn't come back with their drinks yet. He walked up to the hostess stand and Jackie couldn't understand why. When he came back, he kept asking her to stand up and again, she was so confused. "Finally, Neil got down on one knee and I still didn't stand because I didn't actually believe it was happening, and I started looking around the restaurant, where there was only about 5 people seated at this point, and saw both of my sisters walking towards our table and that's when I realized OMG it actually WAS happening now!" Both of their parents and families joined them for the momentous celebration. "Looking back now, all of Neil's trips to the bathroom and phone calls make sense, since Plans A & B fell through he had to corral everyone to get there hours earlier. That was our Christmas 2018. It was the best Christmas I've ever had so far in my life."